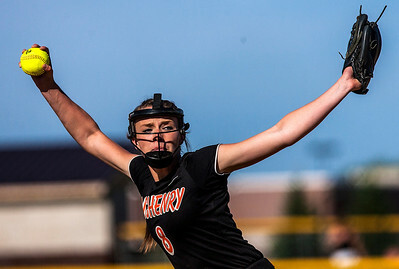 Kyle Grillot - kgrillot@shawmedia.com McHenry's Kristin Koepke pitches against Dekalb during the third inning of the Class 4A sectional Tuesday in Algonquin. 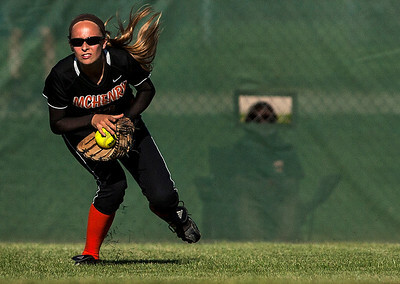 McHenry lost to DeKalb, 8-4. Kyle Grillot - kgrillot@shawmedia.com DeKalb's Katie Kowalski pitches against McHenry during the fourth inning of the Class 4A sectional Tuesday in Algonquin. McHenry lost to DeKalb, 8-4. Kyle Grillot - kgrillot@shawmedia.com McHenry's Kristin Koepke celebrates with coach John DiFrancesca after a hit during during the second inning of the Class 4A sectional Tuesday in Algonquin. McHenry lost to DeKalb, 8-4. 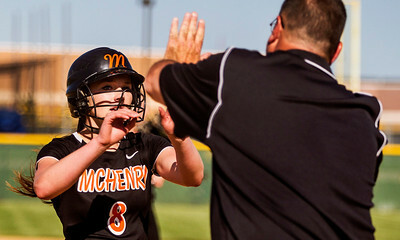 Kyle Grillot - kgrillot@shawmedia.com McHenry's Alexandria Mertens fields the ball during the fourth inning of the Class 4A sectional against DeKalb Tuesday in Algonquin. 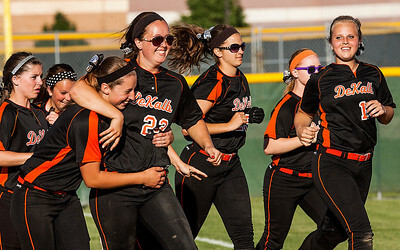 McHenry lost to DeKalb, 8-4. 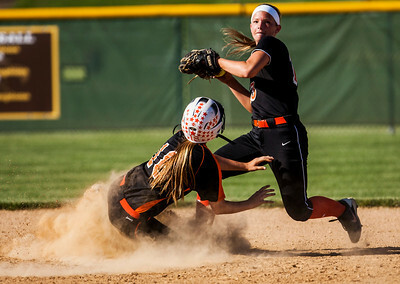 Kyle Grillot - kgrillot@shawmedia.com Dekalb's Morgan Newport (left) safely makes it to first base as McHenry's Ashley Clingingsmith attempts to tag her out during the fourth inning of the Class 4A sectional Tuesday in Algonquin. McHenry lost to DeKalb, 8-4. 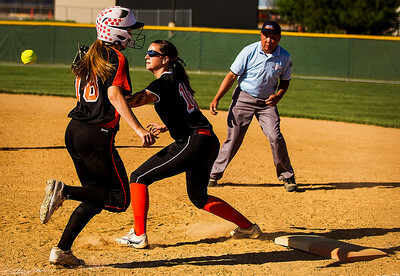 Kyle Grillot - kgrillot@shawmedia.com McHenry's Rachel Ford (right) throws the ball to first after tagging out Dekalb's Morgan Newport pitches against Dekalb during the fourth inning of the Class 4A sectional Tuesday in Algonquin. McHenry lost to DeKalb, 8-4. 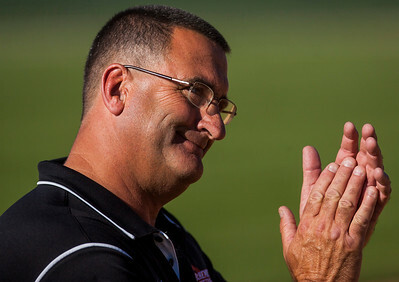 Kyle Grillot - kgrillot@shawmedia.com McHenry head coach John DiFrancesca cheers on his players during the fifth inning of the Class 4A sectional Tuesday in Algonquin. McHenry lost to DeKalb, 8-4. 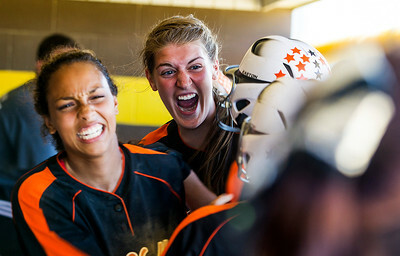 Kyle Grillot - kgrillot@shawmedia.com DeKalb's Haley Tadd (center) and Jessica Townsend celebrate a scored run during the fifth inning of the Class 4A sectional Tuesday in Algonquin. DeKalb beat McHenry, 8-4. Kyle Grillot - kgrillot@shawmedia.com DeKalb's Sarah Friedlund (right) runs towards home plate to celebrate with her team after hitting a home run during the fifth inning of the Class 4A sectional Tuesday in Algonquin. DeKalb beat McHenry, 8-4. Kyle Grillot - kgrillot@shawmedia.com McHenry's Katelyn Sena fields the ball during the sixth inning of the Class 4A sectional against DeKalb Tuesday in Algonquin. 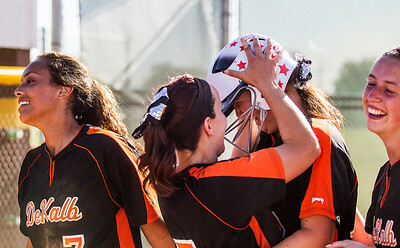 Kyle Grillot - kgrillot@shawmedia.com DeKalb's Sarah Friedlund (second from right) celebrates with Rachel Johnson (center), Jessica Townsend (left) and Katie Kowalski after hitting a home run during the fifth inning of the Class 4A sectional Tuesday in Algonquin. DeKalb beat McHenry, 8-4. 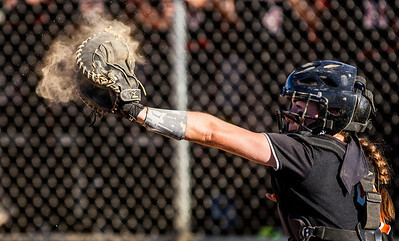 Kyle Grillot - kgrillot@shawmedia.com McHenry's Carly Mattson catches a Kristen Koepke pitch during the sixth inning of the Class 4A sectional Tuesday in Algonquin. 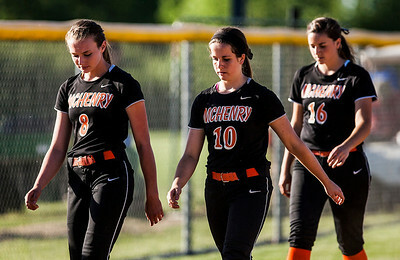 Kyle Grillot - kgrillot@shawmedia.com McHenry's Kristin Koepke (from left), Dana Walsh, and Ashley Clingingsmith walk back to the dugout after the Class 4A sectional Tuesday in Algonquin. McHenry lost to DeKalb, 8-4. Kyle Grillot - kgrillot@shawmedia.com DeKalb's Sarah Friedlund and Katie Kowalski (center left) celebrate with their team after the Class 4A sectional against McHenry Tuesday in Algonquin. DeKalb beat McHenry, 8-4. 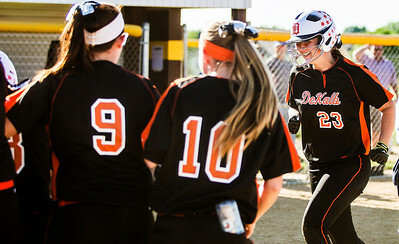 DeKalb's Sarah Friedlund (second from right) celebrates with Rachel Johnson (center), Jessica Townsend (left) and Katie Kowalski after hitting a home run during the fifth inning of the Class 4A sectional Tuesday in Algonquin. DeKalb beat McHenry, 8-4.